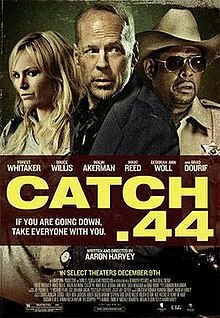 Catch .44 is a 2011 American crime thriller film written and directed by Aaron Harvey and starring Forest Whitaker, Bruce Willis, Malin Åkerman, Nikki Reed, Deborah Ann Woll, and Brad Dourif. Drug boss Mel sends his associates Tes, Dawn, and Kara to intercept a truck driver bringing rival drugs to a diner at night. The women wait for the driver at the diner, but when they fail to identify him, they draw guns on the diner's other occupants and demand if anyone knows who the driver is. Instead, a shootout ensues when Francine, the diner's owner, and Jesse, a patron, draw firearms of their own. Kara, Francine, Dawn, and Jesse are killed and Tes finds herself in a standoff with Billy, the diner's cook. As Tes and Billy point their weapons at each other, their situation becomes more complicated when Ronny, another associate of Mel's, arrives at the diner. It is eventually revealed that no drugs were coming to the diner and the job was a set-up. Mel hired Billy, Jesse, and Francine, who all work for him, to kill Tes and her cohorts. Ronny, who is infatuated with Tes, says he came to the diner to rescue her and steal the money Mel supposedly gave Billy for this assignment, although Billy denies having it. Ronny orders Tes to shoot Billy, but she turns her gun on Ronny, and a second shootout occurs. Mel comes to the diner and discovers Ronny is apparently the only survivor of the gunfight. After a brief conversation, Mel shoots Ronny in the face. Tes, however, turns out to still be alive and guns Mel down. She then intercepts a car carrying Mel's money and drives off with the cash. Shooting started on July 8, 2010 in Louisiana, and lasted 20 days. Early on, there were several changes to the cast, particularly within the female lead roles. Maggie Grace was originally attached to play Tes, and Lauren German was attached to play Kara, however both women had to drop out due to scheduling conflicts. Laura Ramsey was also considered for the role of Dawn. After Malin Åkerman signed on to play Tes, Bruce Willis and Forest Whitaker were attached to the film. Lizzy Caplan and Kate Mara were then brought on as Dawn and Kara, respectively. However, a few days later, Caplan dropped out and was replaced with Deborah Ann Woll for the role of Dawn. Mara dropped out the movie as well, due to scheduling conflicts, and was replaced by Nikki Reed, thus completing the cast. The film features art by Dallas-based artist Elisa Guardiola. The rights to Catch .44 were picked up by Anchor Bay Films. Independent film producer Cassian Elwes brokered the deal. ^ "Anchor Bay takes Annapurna, Benaroya, Emmett's Catch .44". screendaily.com. 2010-05-15. Retrieved 2011-05-22.